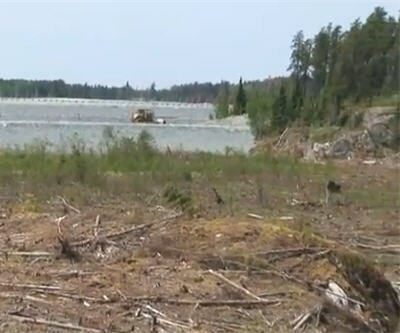 To get a replacement tailing pond started for its mine, San Gold (TSE:SGR) clearcut a forest near the Wanipigow River, but the Manitoba branch of the Wilderness Committee accuses the company of taking down the trees before getting proper permission. The Wilderness Committee says San Gold's tailing pond began a 30-day public comment period on May 24, 2012, and a decision on whether to issue a license is expected in the next few months. "On June 7, a research expedition to the site of the proposed development found that work on the project had already started, and the forest had already been razed," writes the Wilderness Committee. The company counters that proper procedures were followed. "We gained permission to remove the trees and then they were sent to a commercial facility. The company was actually required to pay stumpage fees to Manitoba Conservation in order to take the trees out, so we complied with all the requirements of that permit," said Ian Berzins, chief operating officer for San Gold, in an interview with the Winnipeg Free Press. Manitoba's provincial government is investigating the allegations. San Gold is a Manitoba-based gold miner with a market cap of nearly CAN$400 million and about 400 workers.